A dental emergency excuses no one. Anyone can suffer from them, even children. And because children can’t fend for themselves, the responsibility falls on the hands of you, the parents. While an emergency can’t be predicted, you can still prepare for it by having a trusted emergency dentist in Forster. Keep your child’s oral health safe even in the face of a dental emergency with the help of your trusted Forster Dental Centre dentist. Our team is trained to respond with accuracy and urgency to remove our patients from harm’s way as soon as possible. We understand the special needs of children and practice special care when dealing with them. A dental emergency can’t be predicted. No matter how much you care for your child, there will be times when your child will be subject to an emergency. It is therefore important to be prepared. At Forster Dental Centre, we not only provide immediate care but we also extend our help to your homes by keeping everyone, specially parents, educated on the proper first aid steps to administer. Your child’s safety lies in your hands and how you handle the first few minutes after the emergency really matters. Below are the common children dental emergency and their first aid steps. Remove all food stuck in the mouth by brushing and flossing. Rinse your child’s mouth with an antiseptic mouthwash. You can also use a saltwater solution by dissolving ½ teaspoon of salt to eight ounces of lukewarm water. Do not give aspirin to your child nor put aspirin on the aching area. To reduce pain, apply a clove oil using a cotton swab. If there is foreign material on the tooth, gently rinse it with lukewarm water for no more than 10 seconds. Do not scrub or brush. For a permanent tooth, re-insert in place and bite down on a soft material. Do not re-insert if it is a baby tooth. See your dentist within 30 minutes of the injury. Rinse mouth with clean water. Press the injured area with a clean, absorbent material to control bleeding. To reduce swelling, hold ice over the area. Rinse mouth to remove all broken parts and avoid inhalation. Move the wire in place using the eraser end of a pencil. Cover the edges with cotton. A dental emergency requires a skilled team to keep you from pain and danger as soon as possible. 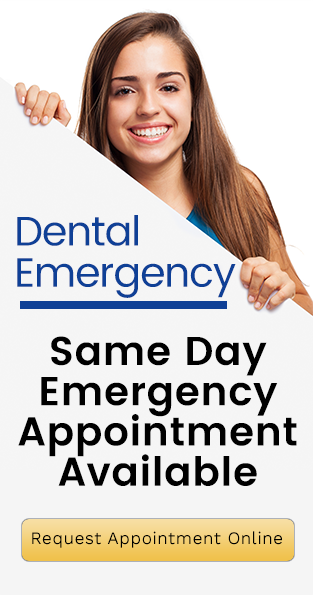 We have same day emergency appointments for dental emergencies.